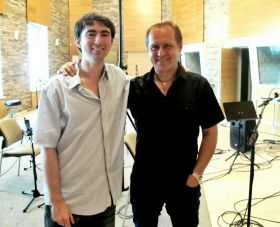 Country music composer Bobby Hamrick worked together with composers from MicRec Publishing and there were created new songs, particularly great songs were accomplished together with Maestro Raimonds Pauls. Guntars Račs, director of MicRec Publishing, tells about the beginning of cooperation: “Visiting sessions are arranged to promote creative activity of authors and international collaboration, as authors meet with each other and exchange their experience, that results with creating new songs. Missy Wilson, manager of Nashville repertoire department of EMI Music Publishing in USA,that is our partnership company, came up with idea to organise joint song writing session with Bobby Hamric, author from USA and Latvian authors. This opportunity seemed to be very interesting. Within a few days 4 new songs were created. Mostly Bobby writes lyrics for songs, but also makes his corrections in the structure and chord sequence of songs. I am very satisfied with all that I hear. Particularly great songs were accomplished together with Maestro Raimonds Pauls. Missy, an agent of Bobbys publishing company, is well known expert of a repertoire in USA and further on new acquisitions will be offered to country music performers in USA. Chris Oglesby, Bobbys agent, in a way is a legendary person as he found new talents before, including Carrie Underwood, popular country music singer in USA. Oglesby together with manager of country music legend Garth Brook has established company that organises well-known TV show in USA American Idol and provides artists with a new songs.